The Royal Australian and New Zealand College of Psychiatrists (RANZCP) supports the availability of vaping devices with nicotine as consumer products for Australian smokers who are unable or unwilling to quit. 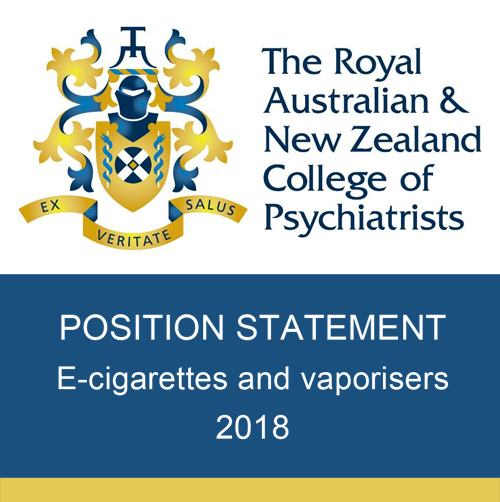 In its first Position Statement on vaping, the RANZCP, the professional organisation of psychiatrists in Australia and New Zealand supports legalising nicotine for vaping along with regulations that are proportional to their level of risk. 'people living with mental illness have high smoking rates, smoke more heavily and have greater difficulty quitting. Smoking is the leading cause of the poorer health and mortality outcomes suffered by this group'. Vaping may be of special benefit to this group as it provides a less harmful way to deliver nicotine for smokers who are unable or unwilling to stop smoking tobacco. Smoking rates in people with severe mental illness have not decreased over the last 20 years. The College recognises that smoking rates in Australia have not declined recently for the first time in decades and that 'tobacco harm reduction is an essential component of any policy framework that aims to improve health outcomes for people who smoke'. The College supports the potential use of vaping for cannabis as well as tobacco as a way of reducing the harm in those who wish to continue using it. The Statement notes the growing evidence for the success of vaping overseas. Results from large population surveys and clinical trial are encouraging. Also, 'smoking rates continue to fall among young people in countries that have widespread access to vaping products... coinciding with continuing declines in youth tobacco smoking rates'. Totally agree with Rachel J Smith. Really time to put the pressure on both sides of parliament with upcoming federal govt. election. For them to leave nicotine and vaping bans as they are is knowing causing hundreds if not thousands of deaths since these stats. show that countries with legal vaping are far more successful than Australia in tobacco control. Stats also indicate that people in disadvantaged groups and mental health issues are more reliant on nicotine and research reveals that nicotine is an effective treatment for some of these problems. The current lack access to nicotine vaping is a serious human rights issue. Big change is also needed with states laws to reverse vaping bans in non smoking areas where vaping would be reasonable and not cause nuciance to others. Example is that vaping should be allowed again in most outdoor areas, just not schools, dining areas etc. The approach of most states treating vaping as smoking is knowingly causing vapers who have quit smoking harm and potential death by exposing to second hand smoke in the limited smoking areas that still exist. Vaping in resonable outdoor areas where smoking is not allowed causes very little or no harm to non smokers/vapers and vapor can be controlled a lot more effectively than smoke. Forcing vapers into smoking areas and applying the very restrictive smoking laws to them is a serious case of discrimination by segregation. This is similar to the shameful history of how countries treated minority groups in the past. This just makes matters worse for people in these minority groups who rely on vaping to give up smoking and/or effectively treat mental health issues. A lot more needs to be done to provide the effective alternative of vaping as simply punishing people for smoking simply isn't working.